January Journal: Day 3 — Ginger writes. We are back to our regularly scheduled Sunday night story circle as of New Year's Day. This week we gathered around my new Modern Forestry "Coffeehouse" candle and told stories about buckets. Story always raises her hand first. She told us that Dad has a bucket for his tools and Mom has a bucket for her cleaning stuff. Bauer remembered when the lake was low last year and he and Cash used a bucket with difficulty to collect water for a sandcastle they were building. Cash also talked about my cleaning bucket and about watering the garden with bucket after bucket last summer. TJ shared of times when he used to wash his own car and would see all the dirt collected at the bottom of the bucket when he dumped the water at the end. Sailor listened as long as her ginger cookies and applesauce pouch lasted, and then she wandered off to play nearby. I talked about picking up pinecones with my sister, each of us children with our 5-gallon buckets in hand, walking around our yard full of pine trees and cleaning up the yard as a regular chore. 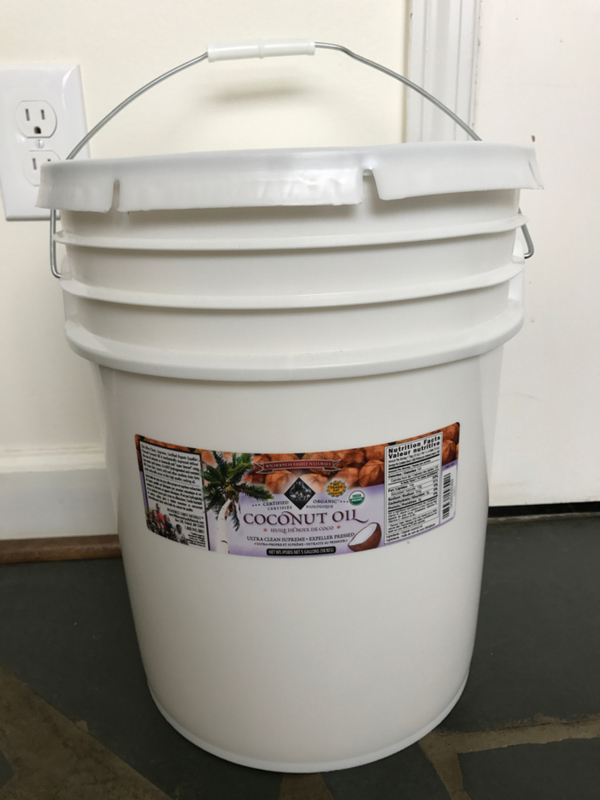 I referred to my bucket of coconut oil, to tell the kids the size of my pinecone bucket. They said they would like to pick up pinecones. And then I asked the kids if they knew what a bucket list is. No one did, so I explained it, and then they wanted to know why it's called a bucket list. TJ looked on his phone and found out it may have to do with the phrase "kicking the bucket" in reference to death. With that established, we did Story Circle Round 2, in which everyone got to share one thing on their bucket list. I was so interested to know what the kids would say they'd want to do someday. Bauer wants to visit every continent, but then last night at dinner, he told us he had changed it to every state. We told him he can want both. Story wants to fly in the air like Peter Pan, so we told her about sky diving. I want to ski the slalom course on our lake. TJ wants to finish all the house projects. Yes, Story, he can use his tool bucket!